I was talking with a friend about my absence from my blog over the past couple weeks and her response to my situation was "Life Happens", to which I thoroughly agreed. Life happened to me. I had a family emergency recently that totally turned my world upside down. I had to leave town suddenly to be with my family during a difficult time. I experienced tons of emotional and physical stress. I was stretched beyond what I thought I could take and challenged to step out of my comfort zone. Overall I'm glad I made the trip. I grew closer to my loved ones and was able to support them when they needed me most. All is well now (Thank God) and I'm happy. However my life has been changed by this experience. First let me say that Life is too short (not the rapper) and tomorrow is not promised to anyone. I've had time to sit and think about who I am and what I want out of life and I've drawn a conclusion that I have to make my dreams become a reality. It's not a matter of IF, it's a matter of WHEN. There is no question in my mind whether I will be successful. I know I will be successful. I am successful. I know I must sound like a hyped up motivational speaker to those who do not know me personally. Honestly I'm really a positive person. I enjoy encouraging others and making the best out of every situation. I always look for the silver lining and this situation has taught me that I can't waste time. My time is quite limited and to do what I know God has called me to do I must be focused. I must understand who God created me to be and what he has created me to do. My purpose is what I'm referring to. I don't have time to dilly dally. I have to keep my eyes straight ahead which means there are some people and things that I will have to say "NO" to, including myself. I've been making changes to my life ever so slightly but now I'm even more determined to change my life for the better. With that said, I am officially re-launching my company "Mrs. Kaye's Creations" this Fall. I've been in my lab working on some special things and I can't wait to share with you all. I'm also pursuing my acting and modeling career. I've had my head shots for awhile so now I need to make my selections, have them re-touched and submit them to the sites that I'm a part of before the Fall. And lastly I'm committing to writing everyday. I'll still commit to my schedule here on the blog which is Tuesdays, Thursdays and Sundays but personally I need to spend time working on my books and screenplay. I have outlines complete and even scenes mapped out for one book and the first chapter written but now it's time to revisit what I have started and complete it. I've had a lot of warnings that I need to work on my craft and this time around I'm not going to be lazy. I will finish what I started at any cost. It feels good to be home. I missed my hubby. I missed my bed. And I missed my blog. Thank you all for your support it means so much to me. This blog has given me so much life and happiness over the last couple months and for that I'm grateful. OH and I really do like to see comments from you guys so leave me a welcome back comment down below. 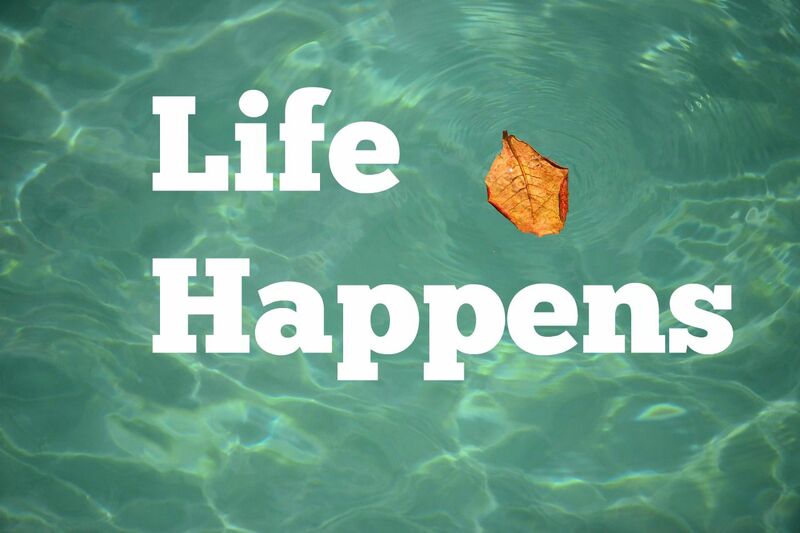 I'd love to hear how you guys refocus when "Life Happens." Thanks for stopping by and as always thanks for reading!! !